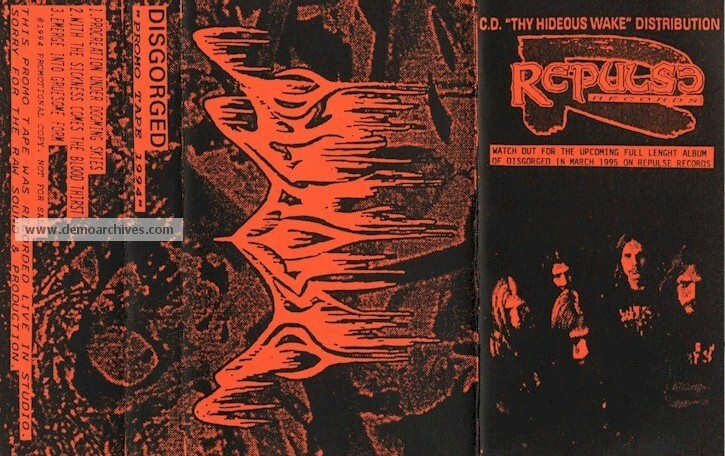 Disgorged were Rochester's own purveyors of brutality, consisting of Adam Bonacci/Vocals, Chris Burgio/Gituars,Growls, Ron Cortese/Gituars, Mike Donnelly/Bass, and Dave Culross/Drums. Brutal riffing by cousins Ron and Chris, sick vocals by Adam, brutal bass playing by Mike, and the untouchable drumming by Dave made them a hard act to follow. Only releasing the demo " Breed for me " and the EP " Thy Hideous Wake ", they were well on their way to leaving a brutal and vicious mark on the metal scene of the era. Sadly in 1995 they split, with Dave moving on to Malevolent Creation/Suffocation, Mike moving on to appear with Incantation, Adam, Ron, and Chris picked up the shattered remains to form Withered Earth. Pro printed b/w cover on thick paper. Includes lyrics. Tapes are studio tapes w/ stickers on the shell.